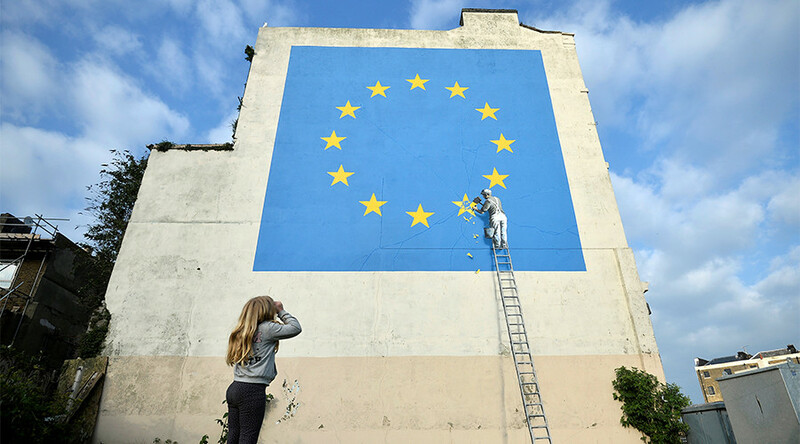 Street artist Banksy has weighed into the Brexit debate with a massive mural in Dover depicting a workman chipping away at one of the 12 golden stars of the European Union flag. The anonymous British icon laid claim to the creation on his Instagram page after it appeared on the side of a house in the Kent port on Saturday morning. His representatives also confirmed the work was by Banksy. The artwork shows a man on a ladder removing one of the EU’s stars.The stars of the flag “stand for the ideals of unity, solidarity and harmony among the peoples of Europe,” according to the EU. The mural, in a town that acts as one of Britain’s gateways to Europe, comes at a time of increasingly tense pre-negotiation talks surrounding the UK’s effort to leave the EU. British Prime Minister Theresa May has accused officials of seeking to disrupt the UK general election. The Dover artwork is across the English Channel from Calais, where another Banksy mural appeared at the ‘Jungle’ refugee camp in 2015. It depicted Apple founder Steve Jobs, whose father was a Syrian immigrant. The artist also criticized the use of teargas against refugees in Calais in January 2016 with a mural on the French embassy in London. The Bristol-based artist is well known for commenting on politics in his street art. He recently created the ‘Walled Off Hotel’ in Bethlehem, a guesthouse that stands close to Israel’s towering security barrier in the occupied West Bank. Despite his high profile, Banksy’s identity has been kept a closely-guarded secret.